His Highness Sheikh Mohammed bin Rashid Al Maktoum, the Vice President, Prime Minister and Ruler of Dubai, attended the H.H. 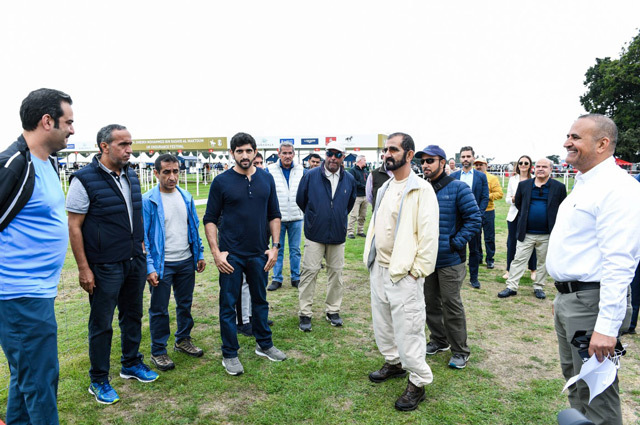 Sheikh Mohammed Bin Rashid Al Maktoum UK Endurance Festival in Euston Park, England on Saturday. Also attending the grand equine event was the H.H. Sheikh Hamdan bin Mohammed bin Rashid Al Maktoum, Crown Prince of Dubai and Chairman of Dubai Executive Council. More than 600 riders from different countries took part in the races. The H.H. Sheikh Mohammed Bin Rashid Al Maktoum UK Endurance Festival is very popular amongst endurance race enthusiasts and professional riders. It has become the richest endurance horse race event in the United Kingdom and Europe with a total purse of 1 million.